It has been so long since I played a VR game that I was planning on writing an article about VR dying on the PS4. Then out of the blue a Keymailer email came in offering us a code for Racket Fury Table Tennis VR on the PS4 VR. 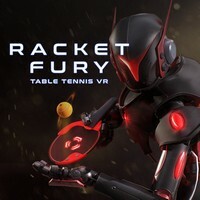 I authorized the expenditure to spend all of the money on doing a review for Racket Fury Table Tennis VR on the Playstation 4 Virtual Reality headset. I like table tennis and I like VR. I especially like VR games that do not get me sick. I have wonderful news to report. Racket Fury Table Tennis VR will not make you sick. I know this because Racket Fury Table Tennis VR did not make me sick. Racket Fury Table Tennis VR looks nice in VR too. I felt like I was standing in front of a table tennis table. The robots we play against look good as well. They animate fantastically. There are a couple of quirks in Racket Fury Table Tennis VR. The first is the ball will roll endless out into space as if there is a floor there. This looked wrong on so many levels. The next thing is you must get your body in front of the ball. If you do not get right in front of the ball the physics go a little wonky. I would reach over to my left and angle the ball back over to the table. The ball would go straight and miss the table on my left. The options in Racket Fury Table Tennis VR are Championship, Practice, Workshop, and Settings. Under Championship there is Rusty Challenge, Plastic Attack, Gold Clash, and Carbon Fury, There are multiple robots to beat in each of the championship areas. They can be very challenging too. Thankfully we level up as we play. I lost so many times in Racket Fury Table Tennis VR I stopped counting. If you work really hard and persevere then you can actually win matches in Racket Fury Table Tennis VR. Make sure you have enough room around you while playing Racket Fury Table Tennis VR. I bruised up my shins running into our couch trying to get in front of balls that were far to my left. My left leg is still stinging and that happened last night. Be careful playing Racket Fury Table Tennis VR.